As a large and active membership of all ages, Mecklenburg Chapter is abounding with programs, projects, and opportunities to be involved in service and leadership. We are proud to share a common heritage of American patriots who pledged their "lives and fortunes" for the causes of freedom and justice. Revolutionary-era British General Charles Cornwallis called Charlotte and the surrounding areas a "hornet's nest of rebellion" to the Crown. We have been distinguished by the name Hornet's Nest ever since. The Mecklenburg Chapter aims to promote HISTORIC PRESERVATION, EDUCATION, and PATRIOTIC ENDEAVOR in our community, state, and country. 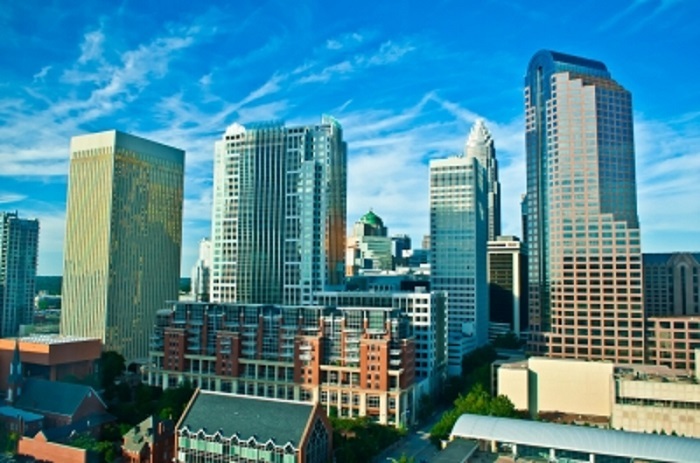 The City of Charlotte originated at the site of two trails of the Catawba Tribe where Native Americans traded. The city was chartered in 1768 and its selection as county seat in 1774 has been attributed to General Thomas Polk, great uncle of James Knox Polk, the 11th President of the United States. Our city is the namesake of Queen Charlotte, wife of British King George III. 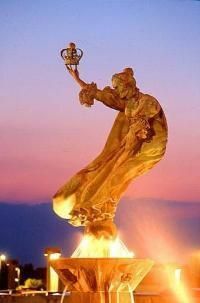 This statue of the queen greets visitors at Charlotte Douglas International Airport. Mecklenburg County, in which the City of Charlotte lies, is named for the German principality of Mecklenburg-Strelitz which was Queen Charlotte's native home.